The 60 Sunreef Power was made in response to the growing demand for compact yet highly impressive powerboat. This yacht has all the features of the popular 70 Sunreef Power, except its 27.8 ft / 8.5 m beam that makes it more convenient for crowded marinas, especially in the Mediterranean. EWHALA has been commissioned by a European owner, and is laid out in a semi-owner version with two double cabins in the forward section, two double cabins in the starboard hull, and one double, one bunk-bed cabin (for the crew) in the port hull. 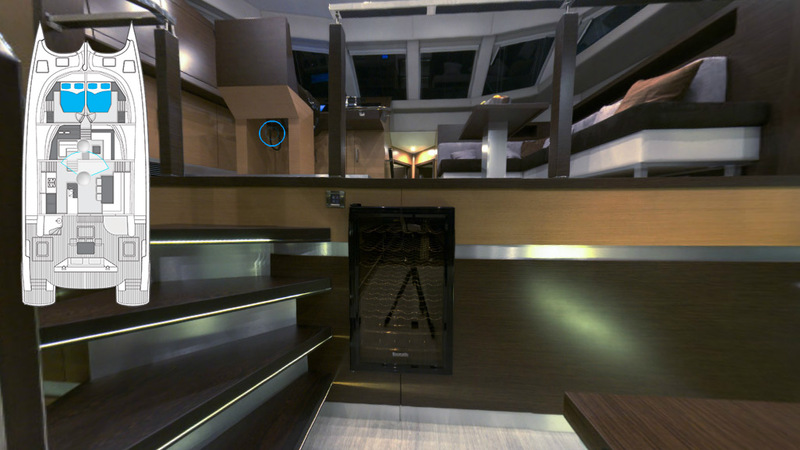 The interior of the main deck features the galley and a dining area, while a mezzanine floor located in the midship comprises internal helm station and lounge, providing access to the forward guest cabins. The spacious sun deck, Sunreef’s speciality and trademark, accessible from the cockpit, houses external helm station, wet bar with barbecue, dining area and a huge sun pad, ideal for outdoor lounging in the sun. The innovative JMS boat control system by ZF Marine Electronics Group, allowing the boat to be easily maneuvered with a joystick, has been installed aboard EWHALA. It is a very rare feature on large catamaran yachts, and Sunreef is delighted to apply this system on its new power model. The interior design is modern and minimalist, based on wenge and oak contrast, finished with gray and white upholstery and brushed stainless steel details. She is available for charter via Sunreef Yachts Charter.